January 18, 2011  Investors are digesting the news that CEO Steve Jobs is taking another health-related leave of absence. December 27, 2010  Word from Taiwan about Apple's shipment goals has renewed talk that the much-anticipated Verizon-version of the iPhone may soon be available. 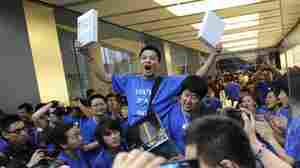 October 5, 2010  The sales of the iPad now make it the most quickly adopted non-phone device ever. 4.5 million units fly off the shelves each quarter. That's a lot of iPads. July 12, 2010  The product testers at Consumer Reports have weighed in on the iPhone 4 reception debate, saying they can’t recommend it because they’ve detected the reported reception problem in their lab. April 29, 2010  My old iPod isn't worth much now... but Apple stock.. that's another story.